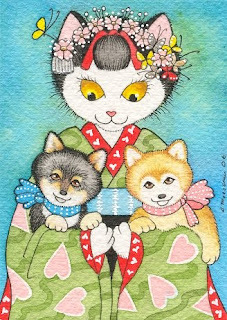 The Shiba Club was invited again this year to participate at the Children's Day and Kite Festival on Saturday April 2, 2011 at Margaret T. Hance Park next to the Japanese Friendship Garden from 10am to 3pm. We will have a tent for shade there for the dogs and a game for the children to play as well as an Easter Egg Hunt for the Shibas planned by Donna and Kai! The dogs are always a big hit for the Children to come and see and you never know what antics will happen when a group of Shibas get together to show off their stuff. So Bring your Shiba, bring a chair and come enjoy a pleasant day of fun and kites! We only had 5 volunteers come last year so we need more volunteers and dogs to come and enjoy the day. If you need directions or more information call Wendy at 623-849-5281.
thank you all so much for having us and viesa at the kite festival today! we had a great time and look forward to getting to know you all better.